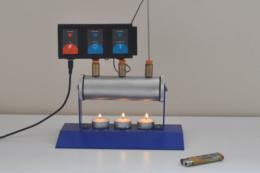 An ideal gas can be characterized by three parameters: volume, pressure and temperature for a certain amount of gas. Maybe the first problem with this gas law is its name. When students hear the term ideal gas law, they interpret that in reality this law does not describe correctly the behavior of gases, in spite the fact that real gases usually agree with the predictions of the ideal gas equation to within 5%. 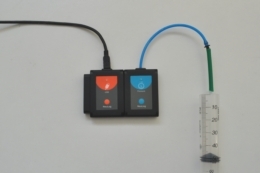 This kit allows students to investigate, with the help of logger sensors, the dependence of pressure on a gas (air) with changes in temperature and volume. 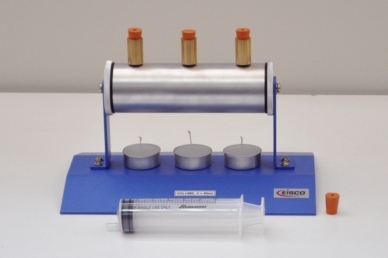 The kit contains a metallic cylinder with inlets to measure gas temperature and pressure through sensors and an inlet for a syringe to change the total volume of the gas (air). Gas study device (55 ml volume), Three perforated rubber stoppers, Non-perforated rubber stopper, 50 ml syringe, Three candles.